Gombe is the site where Jane Goodall conducted her pioneering research into the behavior of wild chimpanzees, beginning in 1960. "If we’re going to keep these iconic chimpanzees on the planet, we need to address the spread of infectious diseases," says disease ecologist Thomas Gillespie. Infectious disease should be a key consideration in wildlife conservation, suggests a study focused on primates in Tanzania’s Gombe Stream National Park, published by PLOS Neglected Tropical Diseases. The study investigated the parasite Cryptosporidium and cross-species transmission risks among humans, wild primates and domesticated animals within the greater Gombe ecosystem. 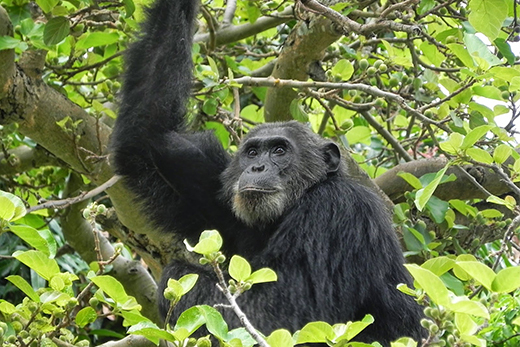 “We found that people are likely exposing the endangered chimpanzees of Gombe to a particular species of Cryptosporidium, which may be contributing to their decline,” says Michele Parsons, a PhD student in Emory University’s departments of Environmental Sciences and Environmental Health. “It appears to be a case of spillover, or exchange of a pathogen, from humans to animals, instead of the other way around.